Never challenge a scorpio to a game of Chicken! If you go running, hiking, hunting, camping or any other activity in the desert, sooner or later you are bound to meet up with a scorpion. For the most part, scorpions are far more scared of you than you are of them. Although there isn't a "scorpion repellent" on the market that you can easily spray on, there has been limited success with aromatherapy-grade cedar oil mixed with a vegetable oil. There are also several other things you can do to make sure you don't come across a cranky scorpion. Gather together base oil, cedar oil, extra-small dar-colored glass bottle and an eyedropper a couple of days before your outdoor adventure. It's best to do this over a sink or somewhere that can be easily cleaned should there be a spill. Give yourself a test patch of the cedar oil. Dilute the cedar oil in the base oil with this ratio--one drop cedar oil to ten drops of the base oil. Put one drop of that mixture on your elbows, the back of your wrists or on a spot on your arms. Wash your hands and go about your day. If you don't receive any bad health side affects in the next 24 hours, then you should be safe to use cedar oil as a repellent. Apply the repellant as you would a perfume. Use as little as possible. 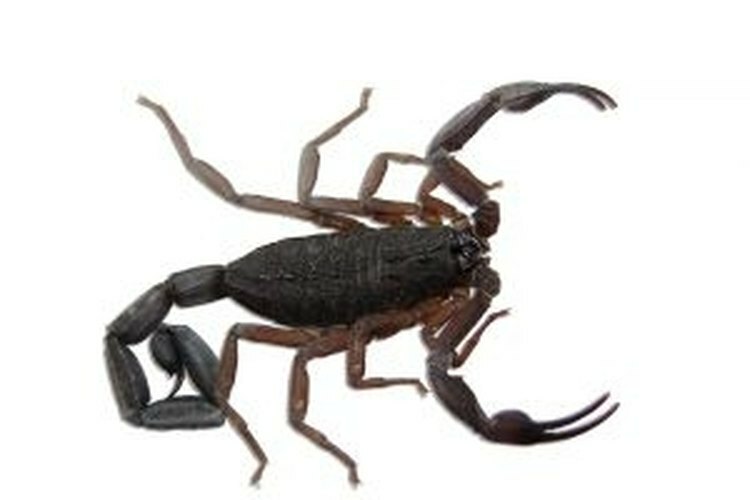 Wear long pants, heavy long socks, boots or sturdy footwear when going into any areas known to have scorpions. Avoid poking your hands into any interesting cracks or holes during your trip. Scorpions like to live in little holes. If something really valuable of yours (like a ring) rolls into a hole, try to get it out with a stick first or put a heavy glove on your hand before reaching in. Drive sticks or tent pegs into the ground whenever you want to take your shoes off. Put the shoes, bottom-side up onto the tent pegs. This way, scorpions and their prey won't crawl into your shows as you snooze. Turn your shoes upside down and shake them before sticking your feet inside. You should also do this with your sleeping bag, just in case. Scorpions are sluggish in the cooler weather. They won't suddenly spring to life as they will in warm weather. Keep your campsite clean to avoid bugs coming for your food. The scorpions will then follow the bugs. You can substitute citronella oil for cedar oil, but that is not reported to be as good as cedar. However, if your body can't tolerate cedar oil, it may tolerate citronella. Those prone to headaches or migraines will often find that the strong scent of cedar may trigger a headache or migraine. If you are stung, try to remain as calm as possible. Getting excited makes the venom move around quicker in your body. Rinse with water and get professional help immediately. Cutting the skin and trying to squeeze venom out does not help with scorpion stings. Don't drench yourself in cedar oil or any other kind of aromatherapy oil without first doing a test patch. Don't ever put cedar oil at 100% strength on your skin, in water, on your pet or on equipment. Don't keep the cedar oil mixture on if your body won't tolerate it any more. Wash it off.